NASA will launch 2000 meals of lobster and duck into space, much to the excitement of orbiting staff. The Christmas holidays are coming up, and for many that means a journey home to eat enormous dinners with friends and family. While you're chowing down however, remember that not everybody is fortunate enough to have access to fine dining, especially astronauts orbiting the planet. Most space travelers can tell you that astronaut food is dehydrated, freeze-dried, and preserved beyond recognition because fresh food doesn't keep in the blackness of space. 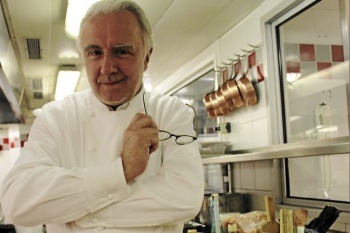 That can be rather discouraging during a prolonged mission, so NASA will address the problem with MonÃ©gasque chef Alain Ducasse, who is preparing 2000 gourmet astro-meals for special occasions. According to French newspaper Le Parisien, Ducasse has designed several fine-dining packages for astronauts to enjoy, including lobster, organic quinoa with seaweed, duck confit, and even chocolate cake. The full menu consists of 25 dishes requested by the astronauts, who will consume the meals during training and an upcoming June space mission. The 2000 meals will be packed into sterilized aluminum boxes and launched into space next year, presumably in what will be the most treasured compartment of the entire shuttle. These meals should provide an immeasurable boost to astronaut morale. After all, outside of their highly qualified resumes, astronauts are still human beings who love breaking up the monotony of living where you work. Let's just hope the astronauts are tidy eaters; nobody wants to hear about a space disaster caused by flying remnants of cake and lobster.